Our air-conditioned studio apartments are located just a few metres from the quiet road that runs through the village of Castara. Entry to these delightful accommodations is up two or three steps onto a small covered porch area (12 x 7 feet) in front of each studio, with a table and chairs for two people. 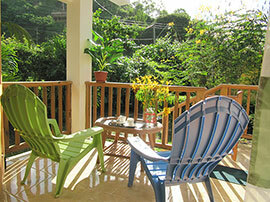 This is the spot for relaxing, eating and generally hanging out when not at the beach. From the front porch, overlooking the gardens and beyond, one can spot hummingbirds, geckos and colourful lizards, and during the evening, fireflies. 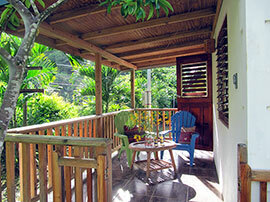 One studio overlooks the garden and the second overlooks both the garden and the village green and rainforest. 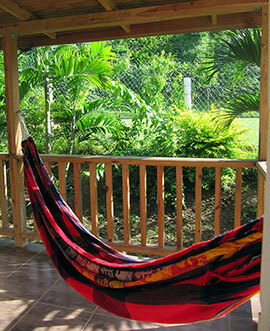 Both studios are configured identically, except that one faces the village green and has both a front porch and a large side porch (16 x 7 feet), offering extra space for sitting, eating and for taking your ease in the hammock. As can be seen in the photos, the porches are sheltered from the rain and are open, to allow the breeze through and to make the most of the views onto the garden. The interior of each studio consists of an open plan kitchen area that extends into the bedroom area, in a room that measures 20 x 12 feet. 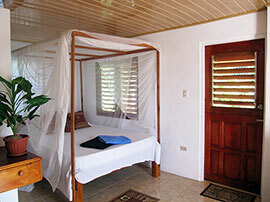 There is a double bed with a wooden frame that supports a large and good quality mosquito net. 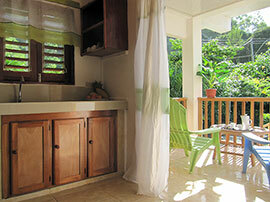 Adjoining the bedroom area is a fully tiled shower with hot and cold water, toilet, and small washbasin. At the other end of the room is the kitchen area with cooker and fridge/freezer with tiled floor for coolness. The outer wall is constructed of rendered blocks with an effective system of louver shutter/windows to offer optimum air movement and breezes. Air-conditioning is also installed.